HorseRacingFLA will be on site at Gulfstream Park on Saturday or coverage with stories and photos of the $9 million Pegasus World Cup (Grade 1) and the day’s other stakes races. Here is the list of stakes races, with scheduled post times. 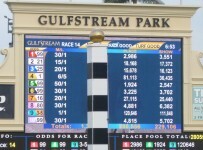 First post is 11:30 a.m. Eastern for the 12-race card. Nine of the races are stakes. NBC’s over-the-air stations will have live coverage from 4:30 p.m. to 6:00 p.m. Eastern. 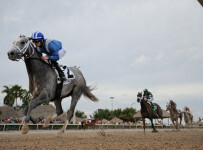 That will include the Pegasus World Cup Turf Invitational and the Pegasus World Cup Invitational. 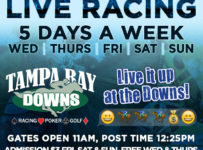 Tampa Bay Downs will be among Florida pari-mutuels that will have simulcast wagering on all of Saturday’s Gulfstream races. *Third race — $150,000 Gulfstream Park Turf Sprint, 5 furlongs 4-YO and up’12:30 p.m.
*Fifth race — %150,000 Ladies Turf Sprint, 5 furlongs, F&M 4-YO and up, 1:30 p.m.
*Sixth race — $100,000 South Beach, 7 1.2 furlongs turf, 3-YO, 2:00 p.m.
*7th race — $150,000 Hurricane Bertie, 7 furlongs dirt, F&M.4-YO and up, 2;33 p.m.
*eighth race — $200,000 La Prevoyante (Grade 3). 1 1/2 miles turf, F&M 4-YO and up, 3:05 p.m.
*ninth ravr — $150,000 Fred W. Hooper (Grade 3), one mile dirt, 4-Y3/17O and up, 3:38 p.m.
*tenth race — $200,000 W. L. McKnight (Grade 3), 1 1/2 mile turf, 4-YO and up 4:14p.m. *11th race — $7 million Pegasus World Cup Tutf (Grade 1 3/16 miles, 4-YO and up.4:51 p.m.
*12th race — $9 million Pegasus World Cup (Grade 1)), 1 1/8 miles dirt, 5:36 p.m.